CSCS is happy to announce that the Phase C of the Phoenix cluster of CHIPP has being put fully operational this Tuesday. At the same time Phase B has been switched off and is being decommissioned. The cluster Phoenix is being used to analyze as Tier 2 the data being produced by the LHC experiment at CERN in Geneva. 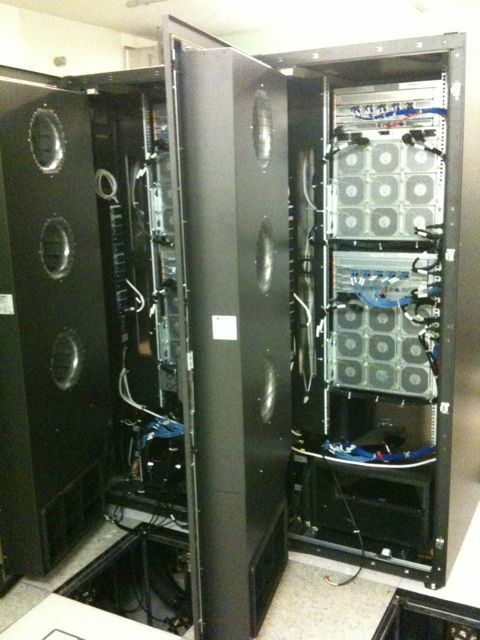 The old compute nodes will be transferred to Swiss universities and used in Tier 3 environments. We wish the researchers of CHIPP and Cern gut luck in the search of new subatomic particles. In the next pictures you see the Phoenix sysadmins dismantling the old hardware.